Each greeting card is available in two versions: a PDF version and a DOC editable version. 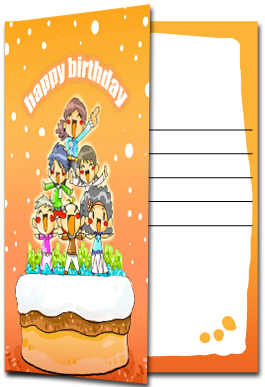 Below are the two versions of our popular Birthday Card with Kids on a Cake (small) greeting card. The PDF (below) is a PDF file (which you can view and print with Adobe Acrobat.) You can't edit it on the computer, but you can write your message on the lines inside. The DOC editable version (shown below) can be opened in Microsoft Word. You can customize it with your own special greeting. The PDF versions require Adobe Acrobat Reader or another program that can display the PDF file format. The DOC versions require Microsoft Word or Open Office Writer.